Relax! Imagine yourself kicked back in a comfy arm chair with a great beach book, feet propped up on the ottoman, your favorite CD playing in the background….you glance up and your eyes travel easily across the room, out the sliding glass doors, over the deck to the dunes and ocean beyond. Fantasy? Nope! It's you on vacation in Cedar Reef Villa D-103 on beautiful, natural, Harbor Island. This condominium villa offers all the comforts of home, including cable television, in both the living area and the bedroom and WiFi. Plenty of sheets and towels are provided, and the kitchen is fully equipped for cooking. A large fridge provides ample room for your groceries and a full sized washing machine and dryer make it a breeze to wash out sandy bathing suits and dry damp beach towels. A queen bed in the bedroom and a full sized sleeper sofa in the living area accommodate four. 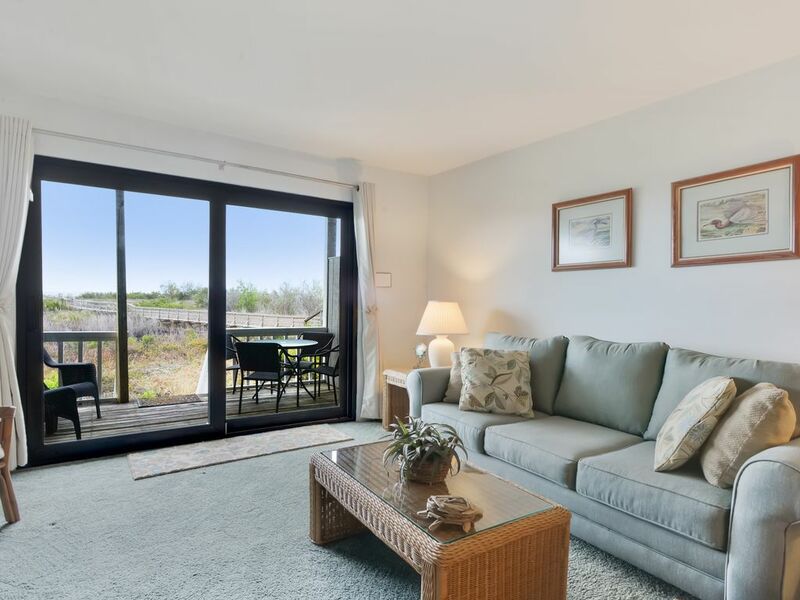 When it's time to head for the ocean, you can step right off the back deck and onto a walkway to the beach! All rates exclude taxes and vehicle gate pass; departure cleaning added to stays of less than one week. No smoking, please. Fire laws prohibit use of grills on decks, but there are permanent camp-style charcoal grills for guest use in adjacent common areas. Rental includes use of the two condominium complex pools as well as the Harbor Island Beach & Racquet Club, where you can relax by the Olympic sized pool overlooking the marshes of the Harbor River, enjoy a game of tennis or sand volleyball, and sip a cool drink from the little store and sundries shop at the Club. The Beach Club also has a kiddie pool and a playground to keep little ones entertained!Harbor Island boasts 2.5 miles of natural beach and acres of pristine marsh. It is quiet, peaceful and may be just what you are looking for if a break from the hustle bustle, crowds and traffic is what you need. *Seasonal dates and rates subject to change. Rates are rent only. Add departure cleaning, 10% SC taxes, 3% booking fee and vehicle gate passes. Gate pass fees are per vehicle: day pass $11; 1-5 night pass $11 PER NIGHT; 6-7 nights $70; 8-14 nights $80.00; 15-21 nights $85; 22-30 $90; 31-90 nights $100; 91-364 nights $115. Where applicable, pet fee is $150 per stay. *Property furnishings are subject to change and may not reflect the property pictures. This material is based upon information, which we consider reliable, but because it has been supplied by third parties, we cannot represent that it is accurate or complete, and it should not be relied upon as such. Community pools are open from April 1 through October 31. Harbor Island is a gated beach community 14 miles south east of charming historic Beaufort SC. Harbor Island is quiet and low key, and offers 2.5 miles of natural beach, acres and acres of unspoiled tidal marsh, several bird sanctuary lagoons. Beaufort is about 25 minutes away and is a lovely town similar to Charleston or Savannah, but on a much smaller scale. Beaufort offers shops and restaurants along the waterfront Intracoastal Waterway. (both horse & buggy and walking tours) and boat tours are available from the downtown marina. If using a GPS or on-line mapping program, enter Saint Helena Island instead of Harbor Island....Harbor is considered to be a part of the larger township of Saint Helena Island. Golf: There are several golf courses open to the public, within an easy 20-30 minute ride. We will be happy to provide a list of the courses and contact information. Came down to escape the hectic day to day grind of the real world. Harbor Island is beautiful and very unique to any other beach we’ve visited. Lots of wildlife! But almost to a fault. Make sure you watch out for snakes right outside your condo, sting rays, horseshoe crabs, and sharks while in the water... Tides are very extreme and change 4x a day every 6 hours. So if you like water play, or even floating to cool off, this isn’t for you. Water doesn’t get deeper than knee deep for 300 yards out from the beach. Now on to the inside.. Couldn’t watch TV in Living Room for first 4 days of our stay. Had to lay on the bed in the bedroom to watch TV after dinner or even when returning in from the beach to relax over lunch. All the shelves in the refrigerator are duct taped together, so be careful of how much you put on them. None of the bathroom doors latch or could be locked for privacy. Air Conditioner locked to where it can’t get below 70. Oven quit working half way through our stay and would only work in the broil function. So make sure you check all your appliances before going and buying a weeks worth of food. All in all, you get what you pay for and for the price, you can’t expect much more than you are getting. Beaches are ideally populated. Every family has about 50’ in between umbrellas, which is great. The people are nice, the guards at the guard shack are on point, so it’s nice piece of mind to know that not just anybody is roaming around the parking lots/condos while you are at the beach or asleep in your condo. Harbor Island is on the Atlantic Ocean and that is where sea life lives. ...we are not sure what the guest was expecting to see in the ocean. 2 High tides and 2 low tides are the norm for Planet Earth, no matter where you are. Above our control. Guest checked in on Saturday with a complaint about the TV in the living room. There was still a working TV in the bedroom. A replacement TV was delivered on Monday. How is that 4 days? The guest did not report anything about duct tape in the refrigerator, bathroom locks or oven during his stay. These issues would have been addressed and corrected just like the TV was. The thermostat does not have a lock and why do you need it below 70 anyway? We wish the guest would have let us know during their stay of any other problems, so we can correct it as soon as possible. Don't wait until you check out. We are happy the guest felt secure and had plenty of room on the beach. This was without question the most relaxing vacation ever. The unit was clean, very spacious and very well equipped. The walkway to the beach was beautiful. I don't think I have ever encountered so much wild life in my life, and it was beautiful. We went and watched the baby turtles find their way to the water and our seven year old thought it was the greatest experience ever. Even my husband who dreads beach vacations and hates the ocean had a wonderful time. The entire community was immaculate and quiet. We went down for my nephew's graduation from Parris Island and we think we might make the 12 hour ride every year to make this our new vacation spot. And everyone should check out the Hunting Island park and the Marsh boardwalk. You'll be glad you did. If you love nature the way God intended it, this place is where you can find it all. My husband and I had the most relaxing vacation ever. The unit was very neat and clean. There are 3 pools on the property and the beach is just a short walk away :) There are so many neat activities within a few miles from the villa. We went to Hunting Island State Park and saw the lighthouse and the boneyard. Dolphins were everywhere! If you time your trip just right, you can even go see graduation at Parris Island. Its definitely worth it. The seafood was great. We went to Johnson Creek Tavern twice. If BBQ is your thing, Duke's in Beaufort is wonderful. There were several families staying in the villas. Most had been coming back for several years. We would absolutely recommend this property and will make it an annual trip although I will make a change in the arrival date to go earlier or later in the season as we are older and travel by ourselves. The property manager was so helpful - from the time of booking until we weren't ready to home yet and I called to ask to extend our stay 1 more night. Also, if we had any questions about the area (where to eat, things to do), the folks at the guard shack were extremely nice and helpful. Note: Even though this is a 1st floor unit, there are steps you must climb to get in and out. Vehicle gate pass fees are per vehicle and set by the Island. Rates effective 11/01/2017: day pass $11.00; 1-5 night pass $11.00 PER NIGHT; 6-7 nights $70.00; 8-14 nights $80.00; 15-21 nights $85.00; 22-30 $90.00; 31-90 nights $100.00; 91-364 nights $115. NOTE: pass fees are set by the Island and are subject to change. 3% Service Fee. Starter supplies (1-3 nights) provided of paper towels, dish and dishwasher detergent, trash bags, toilet tissue, hand and bath soap.